At a street food stand in Kompong Thom Province, Cambodia, young people chatted about the passing of their former king. It was a lively scene that night—fully inhabited tables and chairs scattered across a bustling parking lot, steaming plates of noodles and bobor, lights flickering out occasionally as a generator alternated between success and failure. The hot air buzzed with tinny music, laughing, and talking, and aromas of fried noodles and durian permeated the slight breeze. 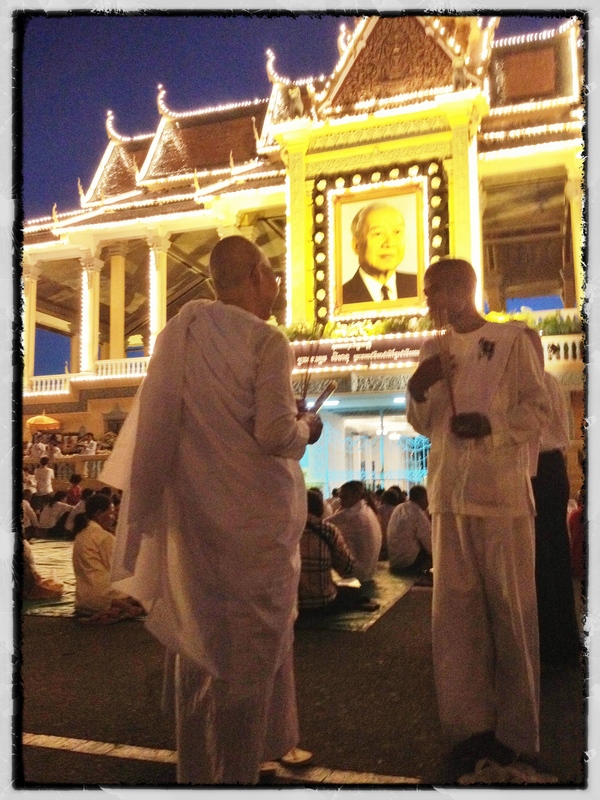 As the night wore on, the expat and Cambodian who were my dinner companions translated the surrounding chatter for me: Some young girls were talking about a recent discovery, that former King Sihanouk‘s image had been seen in the waxing moon. In the week that followed, I saw hundreds of memorial altars to Sihanouk—from grandiose and glittering to humble and makeshift—in cities and towns, villages and temples, homes and roadside eateries. His visage watched from everywhere, if not from the sky itself. And the widespread belief that he watched, also, from the moon quickly became a litmus test for the strength of one’s faith. “If you can’t see the King in the Moon,” one Cambodian I met quietly explained to me, “people say you must not be a good enough person.” I say “quietly,” because he couldn’t state publicly what he was obliquely saying to me: that he couldn’t see any kings in any moons, but that admitting this meant you fell under suspicion, that you must have done something very bad indeed. I told him and a few others the story of The Emperor’s New Clothes. They hadn’t heard it; they nodded and laughed heartily. Wry smiles appeared. Meanwhile the moon, by then full, shone on; I couldn’t see anything that hadn’t always been there —clear evidence of my many sins. Another Cambodian I met briefly told me a story about a stampede that had killed hundreds of people at a water festival a few years ago. He explained that thousands of village people had cut bananas from trees in the countryside and streamed into Phnom Penh to sell them—for around ten times the usual price. “People put the bananas outside of their houses to chase away the bad spirits,” my acquaintance explained. And with all those felled revelers’ spirits floating around after the terrible accident, the market for bananas had gone through the roof. As he told the story, he wryly used the phrase “king in the moon” as a metaphor for the kind of belief system that motivates people to create prophylactic banana shrines, just in case. Faith or superstition? I usually try not to apply that question to cultures not my own; but seeing religion in action in distant places, I can’t help but look back at religion as practiced closer to home and ask myself, faith or superstition: which is which? When self-described leaders of the faith proclaim that some hurricane was send as a punishment from God, is this belief, superstition, or a cynical bid for power? Can unexamined belief erode our perception of reality, engender bigotry towards those who believe differently, or justify acts of brutality? Or is it more important that faith bolsters people’s hope through difficult times and motivates acts of kindness? In short, is religion a net gain for mankind, or does it harm our quest to become rational beings? I have no answers; but I remain endlessly fascinated by the questions. And although I do find religions and their adherents frustrating at times (especially when a society’s bigotries manage to worm their way into religious beliefs) I do find the stories, architecture, and imagery quite lovely, and the possibility of some inexplicable transcendence alluring. Like it or not, religion is inextricably woven into the human experience, and it isn’t going anywhere anytime soon. And there’s wisdom to be found there, even if you don’t, strictly speaking, happen to see the king’s face shining high above. Very nicely said and with beautiful pictures. Welcome home! I’m excited to learn more about a new culture from my part of the world from your perspective. I love this. I believe that humans fundamental have a innate desire to be part of something transcendent–greater than themselves. It manifests itself in various types of spirituality. The most important thing is not dogma but the examination of the questions. As a scientist, I love rationality and the concreteness of being able to prove something. But you can’t prove kindness and you can’t make love rational. Wow, that’s beautifully said, Merrilyn. Thank you!